We furnish eligible children with Linux computers in an effort to ensure no one is left on the wrong side of the digital divide. We not only give these children computers, we teach them how to use them so they may build their own future. Recycled Electronics and Gnu/Linux Used for Education. Reglue, in a nutshell, gives free Linux computers to under privileged children and their families. We have also built computer and technology learning centers in and around East Austin. One of our biggest is the Bruno Knaapen Technology Learning Center based in the Cristo Rey Catholic Church on East Second Street, you can read more about that at the Blog of Helios site. This lab serves the local community and we are privileged to offer weekly classes at that center to teach people how to use a computer and how best to use the Internet for job searches and communicating with their families. Many of our donors give us computers that still have their personal data on them. Reglue values your data just as much as you do and we work to Department of Defense standards to wipe your hard drives to insure no one can recover it. (well maybe to the exclusion of the NSA). We use a software program called DBAN to scrub the information from your drives. Of course, should you deem it necessary, we will gladly accept your computer after you remove the hard drive and we will replace it with one of our own. We run classes at the Reglue facility as the need arises for our clients. Call to reserve your spot or to check on the next scheduled set. These classes are free to the public. If you prefer email, just hit the contact us button at the top of this page. You may also call 512-552-3006. Thank you. An amazing thing happened to me and my children. Ken Starks was able to come over and deliver, set up and train us on a new computer. My two sons, 10 and 12 years old, were extremely frustrated because they were not able to be on a computer at home. 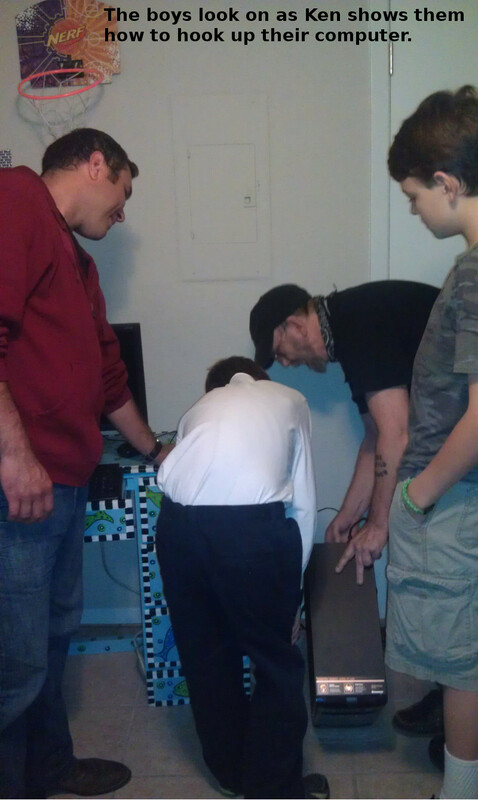 I am thrilled that the boys have a remarkable computer that they can use. Being a single mother, finishing up my degree, I cannot afford to purchase a new machine from Best Buy or even a second hand place. I am ecstatic that they will not lose any valuable time learning and will be able to enjoy a great gift. We are forever grateful to him and the organizations that have donated to Reglue to give us this opportunity. Any redistribution or reproduction of part or all of the contents in any form is prohibited other than the following: you may use parts of this website as example or review to cover the operation or works of the non profit Reglue. With exception of one graphic, which may appear at some time in the future as "Dr. Tux". The rest of the penguin graphics are courtesy of Tux Factory - CrystalXP.net and are not the original work of Reglue or any Director, Volunteer or agent of Reglue. Permission from CrystalXP.net should be obtained before using their graphics in any manner online. you may copy the content to individual third parties for their personal use or online publication, but only if you acknowledge the website as the source of the material.